Looking for the best photo-ops in the area, this scavenger hunt will take you through all the best stops. Grab a friend or two (or three) and track down each of these fun spots. □ From Garth Brooks to Bill Gates, this grouping of hand prints has a lot of history. Pick your favorite square and take a photo of it. □ Built by a local man in memory of his father, take a picture in front of this Norweigan church. □ You can be in two places (states) at once on this pedestrian bridge. Take a picture showing you in both North Dakota and Minnesota. □ With funky branches unlike any other, hop up on this tree and take a pic. □ Head up top to get a aerial view of the Downtown area in a new place you can park your car. Take a photo looking out onto the scenery. □ On Fargo-Moorhead’s largest campus, you’ll find this talking river. Take a photo on the bridge with the water in the background. □ A zoo-like stop with stoic animals is what you’ll find here. Seek out the biggest cow there and take a selfie with it. □ Dressed like a buffalo with a tiger shirt on, take a photo next to this funky statue. □ Some say this movie put us on the map, take a photo with the iconic movie prop in full “Fargo” garb. □ This ice cream treat was created right here in Moorhead, MN. Take a picture in front of the 16 ft. tall statue of it. □ One of Downtown Fargo’s newest spots for a cold treat. Take an angelic photo with one of your team members in front of the mural. □ Stop in at a local brewery and purchase a pint. Take a picture of you and your team clinking glasses. Pro tip: buy one get one coupons are available in the Fargo Visitors Guide. □ Stop by one of the many local coffee shops in Fargo-Moorhead. Order what you want and take a picture while you take a sip. □ Find some lefse to eat. Take a photo of your reaction. Enjoy. □ Stand in between the pillars on the steps of this museum full of art and take a picture. 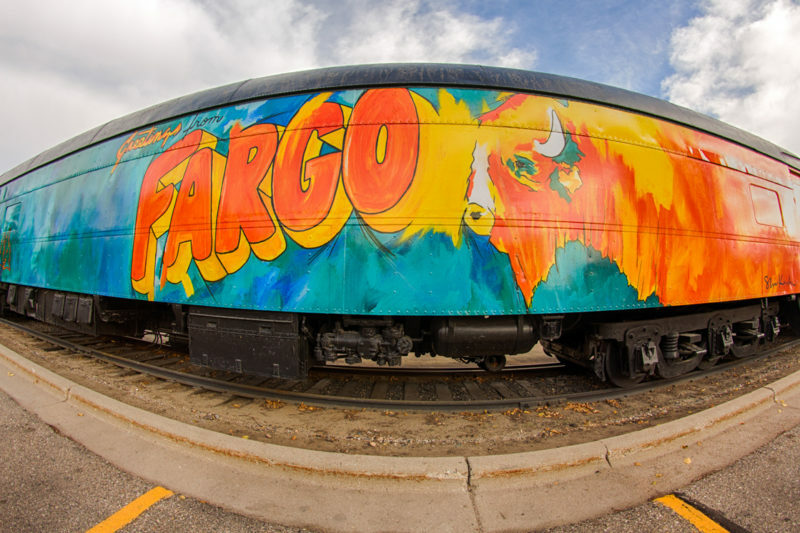 □ Created by local artist Steve Knutson, this colorful art piece welcomes you into Downtown Fargo and is painted on an unconventional surface. Take a photo jumping in front of it. □ The most iconic marquee in all of Fargo, take a picture underneath this downtown feature. □ Spelling out FARGO in sign language, these metal sculptures can keep your bike safe and sound. Stand in front of your favorite one and sign the letter for your next photo. □ Find a cool Fargo souvenir and buy it to support the local gift shop. Take a photo of you with it.